Just a quick note to say that we've arrived safely in Suva, Fiji. 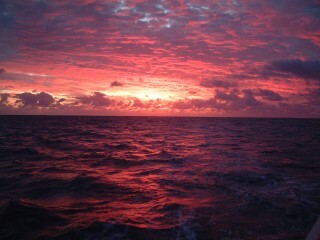 The passage from Tonga was a bit frustrating, but otherwise uneventful except for the strange winds. The first day, we encountered headwinds that prevented us from taking the safer, southern route around the Lau Group, forcing us instead to go through them. We had to motor some of that day to keep up the 5 knots necessary to arrive at our pass through the group in daylight. The second day, the winds came up a bit stronger and we had a delightful sail, even though the wind was still well forward of the beam. That night, the wind came up a bit stronger, forcing us to take not 1 but 2 reefs in the main to slow Ocelot down so we wouldn't arrive too early! 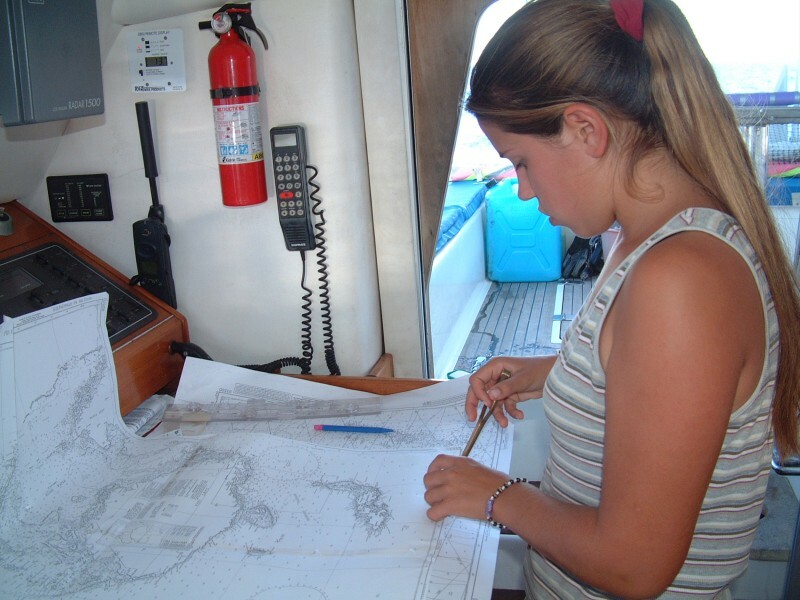 Normally, we could go through passes like Oneata pass at night - after all, it's 5 miles wide, and our electronic charting systems should place us exactly - but the charts here are notoriously inaccurate. In Tonga they were out by about ¼ mile (½ km), but we've heard they can be worse in Fiji. Also, the reefs surrounding the pass do not reflect radar very well. Better to do it in daylight. Sunrise on October 6th - no wonder the sunrise and sunset watches are popular. As it was, we shot through the pass at 7am, after a glorious sunrise, without any problems. It was fun to see all the islands and reefs of the Lau Group, but a bit frustrating that we couldn't visit them. The good news is that friends seem to have found a way around the onerous restrictions on visiting the Lau Group, so we may yet be able to cruise this delightful archipelago. With no more speed constraints, we shook out both reefs, rolled out the full jib and looked forward to a rollicking good sail. The wind had other ideas. Our 20 knots of breeze dropped off and moved well behind us, leaving us with flapping sails. We rolled up the headsail and put up the spinnaker, but we still weren't going fast enough. Then the weather report said a front was approaching Fiji from the west, giving us another time limit. 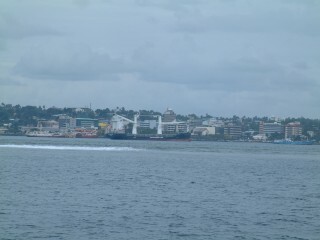 If we wanted to arrive in Suva before the front, we'd need our "iron spinnaker". So we started up the port engine and left it ticking over just fast enough to push us back up to 5-6 knots. Luckily, Ocelot's engine rooms are well sound-proofed so they're hardly noticeable, and the extra electrons allowed us to fully charge the batteries and run the watermaker to fill the water tanks. The approach to Suva was interesting - you follow along the side of the southern reef looking for the funnel of reef that leads into the harbor. This is often harder than it sounds, as the reefs look very different from deck level than, say, from the air. In our case it was fairly easy, if a bit macabre - not only were our electronic charts spot-on, but the reef was littered with wrecked Chinese fishing trawlers! We entered and had the anchor down by 3:30pm but it took until 5:30 (and several calls on the radio) before the clearance boat came and we could go ashore for a nice, land-based meal at the yacht-club. In all, the trip took just 75 hours to cover the 450 miles - an average of 6 knots, which is quite good given the light and contrary winds (even if we did have to cheat a bit). Today (Friday) we plan to finish our clearance procedures, explore Suva (the largest city in the South Pacific Islands), find where Chris has to take his SATs tomorrow, visit some book and chart stores, and maybe even hit the local Costco equivalent (I can hear the credit-card screaming already).